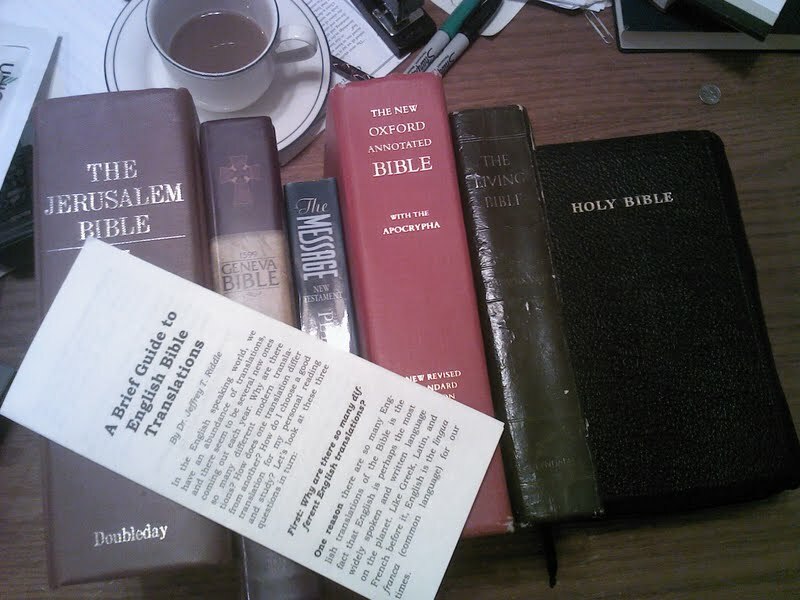 New Tract Available: "A Brief Guide to English Bible Translations"
Bonnie Beach has taken a modified version of a Vision article (and blog post) I wrote titled "A Brief Guide to English Bible Translations" and attractively formatted it into a hard copy tri-fold tract. Copies are now available at CRBC literature table during our Sunday gatherings. If anyone out of town would like some of the tracts we can send them at cost, if you send a request to info.crbc@gmail.com. "For God so loved the world that he gave his only begotten Son…” (John 3:16). The simple phrase “For God so loved the world…” would have puzzled an educated pagan. And the notion that the gods care how we treat one another would have been dismissed as patently absurd. From the pagan viewpoint, there was nothing new in the Jewish or Christian teachings that God makes behavioral demands upon humans—the gods have always demanded sacrifice and worship. Nor was there anything new in the idea that God will respond to human desires—that the gods can be induced to exchange services for sacrifices. But … the idea that God loves those who love him was entirely new (p. 211). In the new paganism of our own times, perhaps this proclamation will be just as novel. Let us be faithful in our generation to hold forth these basic truths: God is love. He delights in the love of his people. He calls on us to love our brethren and to have that love spill over to our neighbor. Book Note: Guy MacLean Rogers' "Alexander: The Ambiguity of Greatness"
Guy MacLean Rogers, Alexander: The Ambiguity of Greatness (Random House, 2004): 420 pp. In this work, Rogers, a classicist and historian, offers a popular level biography of Alexander the Great. In the Introduction, he notes how contemporary historians have tended to present “a far less flattering portrait of Alexander” than previous generations which tended to see him as a heroic or even messianic figure (p. xv). The “new scholarly orthodoxy” has suggested that he be “rechristened Alexander ‘the Terrible,’ or Alexander ‘the Insignificant’” (Ibid.). 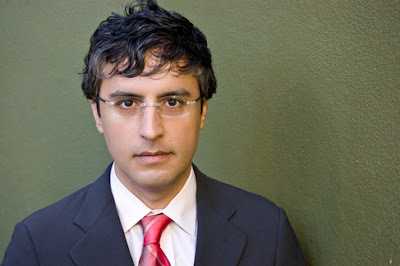 Thus, “Alexander has been retroactively stripped of his reputation and epithet” (Ibid.). Rogers adds that the “new image of Alexander has resulted (in part) from the adoption of a more critical and skeptical attitude toward the ancient Greek and Roman sources for his life” (p. xvi). The body of the book offers a chronological sketch of Alexander’s life from his birth in 356 B. C. and rise to power in Macedonia in 336 B. C. at the assassination of his father, Philip, to his untimely death in Babylon in 323 B.C. after a series of unprecedented military victories that extended his Greek kingdom throughout Egypt, Persia, Afghanistan, and even to India. At the book’s close, Rogers returns to the historical issues raised in the Introduction. Chapter 30 is titled, “Alexander: Mass Murderer or Messiah?” (pp. 280-288). He concludes, contra the aforementioned tendencies of modern historians, that Alexander “was not a genocidal thug like Stalin or Hitler” nor was he “a kind of ancient conquistador” (p. 283). On the other hand, Alexander was not a “messianic figure” nor an idealized “philosopher-king” (p. 286). He was rather “a prodigy or warfare” and a man of his times (p. 283). In the final chapter (chapter 31: “Alexander and the Ambiguity of Greatness” pp. 289-294) the author evaluates the “historical legacies” of Alexander (p. 289). Again, Rogers challenges the conclusions of some contemporary historians who, he claims, have tended to downplay Alexander’s influence, seeing him as merely a “fiery comet” who flashed across the sky, exploded, and then disappeared in “a cloud of mythic vapor” (p. 289). On the contrary, Rogers argues that Alexander’s historical influence was profound. He was “the original architect of an amalgam Greco-Roman civilization in the Near East, which endured politically for more than 1,700 years. For a mere comet, he had a long historical trail” (p. 292). He observes that historical “greatness” is “a far more ambiguous and subjective concept than is usually appreciated” adding that those with great abilities often have correspondingly “great flaws” (p. 294). He concludes: “We must learn to live with the ambiguity of the great. If we are able to live with the ambiguity of the great, perhaps we may live better with our own” (Ibid.). It is typical for Introduction to the New Testament textbooks to begin with some discussion of the so-called Greco-Roman backgrounds to the New Testament and Early Christianity. Inevitably, this includes some mention and discussion of Alexander and the “hellenization” of the ancient world. 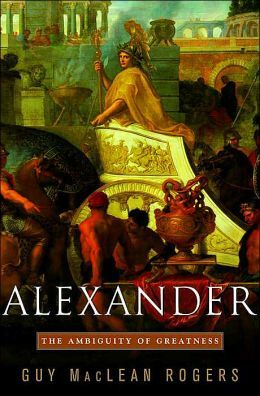 I read this book to better understand Alexander and his legacy. Having taught a “Life of Jesus” class I was also interested in the historical question of how to reconstruct a biography of a figure from antiquity. Rogers addresses both these topics. First, regarding Alexander and hellenization, Rogers observes that Alexander profoundly influenced the origins and evolution of “the three great religions of the book, Rabbinic Judaism, early Christianity, and early Islam” (p. 292). According to Rogers, “few people seem to have reflected upon the question of how and why all the central texts of early Christianity came to be written in Greek” (p. 292). He ponders what the consequences might have been had the foundational texts of Christianity been written “in Hebrew or Aramaic, the everyday language of Jesus and his closest disciples” (Ibid.). He adds: “It was largely as a long term result of Alexander’s conquests that Greek became the primary language through which Christianity was spread throughout the Mediterranean world” (Ibid.). Rogers finds it ironic that the polytheistic Alexander’s efforts to establish “a world empire of the best” had the unintended consequence of “building the civic substructure for a world empire of a god [sic] who made redemption possible for all” (p. 293). Of course, what Rogers sees as an irony of history, the believer sees as the providential hand of the God of the Bible. Second, regarding the historical effort to reconstruct the life of a figure from antiquity, Rogers offers an interesting appendix titled “Sources: Flacks, Hacks, and Historians” (pp. 299-307). He begins by reflecting on the fact that many of the most ancient sources on the life of Alexander, written by his contemporaries, have been completely lost or must be reconstructed from selective quotations in later authors. This calls to mind similar challenges in New Testament studies (e.g., scrutiny of quotations from Papias in Eusebius). Rogers observes: “Only when we have understood the viewpoint of our sources can we access the value of the information they have provided” (p. 299). The art of creating an objective and persuasive representation of Alexander out of such a jumble of sources is not a task for the faint of heart. Indeed, reconstructing what Alexander did (or did not do) can be done plausibly only after a careful sifting and weighing of the value of all the pieces of evidence provided by the sources for any given action of Alexander’s (p. 307). This is striking in comparison and application to the task of reconstructing the life of Jesus of Nazareth. If the historian can refer to material on someone as influential and well known in his times as Alexander as “a jumble of sources” what might he say of Jesus who left such a light footprint in the historical record of his contemporaries? In fact, outside brief, scant references to him in extra-biblical literature (by Josephus, Tacitus, Suetonius, and Pliny) we are left in complete dependence upon the canonical Gospels for our knowledge of Jesus. When the historical reliability of the Gospels is challenged or disregarded it is no surprise that modern historians have either concluded they can know nothing about Jesus except the fact that he did exist historically (so Rudolph Bultmann) or they deny his existence and hypothesize instead that he was a mere mythic fabrication (so Robert M. Price). This makes all the more important the defense of the historical reliability of the canonical Gospels as our foundational sources for understanding the life and teachings of Jesus. Image: The front inside cover of The Majority Text signed by the editor. 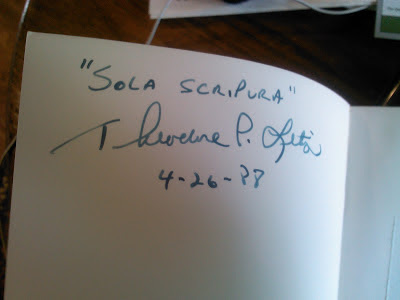 Note that the "t" is missing in the "Sola Scriptura" inscription. Errare est humanum. I much prefer getting a good used book to buying a new one. A few years ago my friend Sherman Isbell pointed me in the direction of Abebooks.com, and I’ve been a faithful patron ever since. Every once in a while I’ll do some searching for an out of print book there that I’d like to have. One I’ve kept an eye out for to acquire for my personal library ever since I read a copy I got from the Union Seminary Library in Richmond is The Majority Text: Essays and Reviews in the Continuing Debate (Institute for Biblical and Textual Studies, 1987), edited by Theodore P. Letis. Since the book is out of print, copies are scarce and the prices usually run pretty high (e.g., a new copy is listed now on Abebooks for over $300). 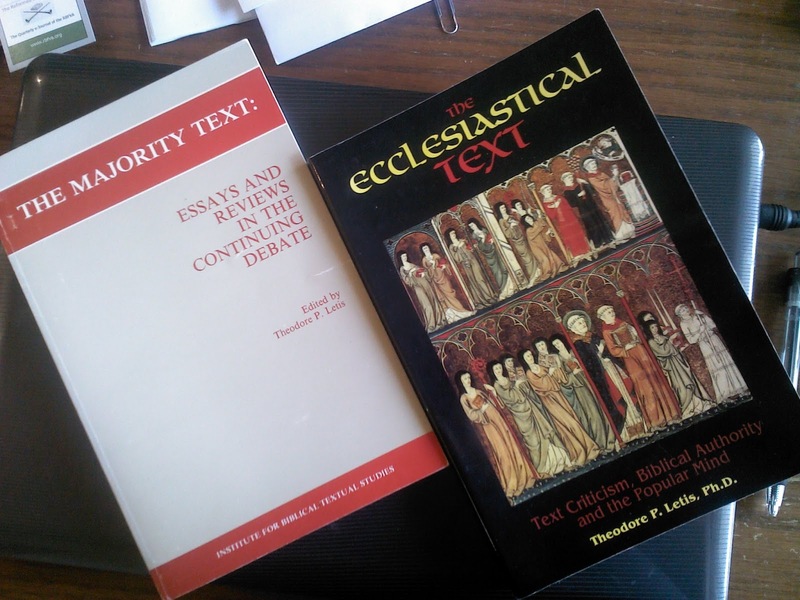 This work, along with Letis’ The Ecclesiastical Text: Text Criticism, Biblical Authority, and the Popular Mind (1997), had a huge impact on my thinking regarding text and translation issues. Anyhow, last week I found someone vending a copy of The Majority Text on Abebooks for a very reasonable price (my guess is the seller did not realize its value), ordered it, and got it on Monday. The copy is in good shape, clean, and unmarked. To my satisfaction, I found that it is also signed in the inside cover by the editor. In the providence of God, Letis died suddenly in 2005 at age 53 (here’s his obituary which appeared in the Atlanta Journal-Constitution). To hear a recording of him, check out his insightful critique of the ESV translation hosted by Still Waters Revival on sermonaudio.com. I am glad to add this book to my shelf dedicated to text and translation study. The Tübingen School has discovered depths in this narrative unknown till it appeared. In the person of Martha, Luke seeks to stigmatize Judaizing Christianity, that of legal works; in the person of Mary he has exalted the Christianity of Paul, that of justification without works and by faith alone. What extraordinary prejudice must prevail in a mind which can to such a degree mistake the exquisite simplicity of this story! Supposing that it really had such an origin, would not this dogmatic importation have infallibly discolored both the matter and form of the narrative? A time will come when those judgments of modern criticism will appear like the wanderings of a diseased imagination (p. 311).